I like the sort of knitting I call plain and boring. It is neither plain nor boring, in fact. I use striping yarn so even if it's stockinette in the round and the only interruption is the end of the ball, there are colour shifts and even if it was smooth solid black wool, there is some meditative quality in repeating the same move endlessly. Until recently, I've suffered from a general lack of knitting mojo. Stranded work was no fun, plain stockinette irritated me to no end... I resorted to sorting out the messier corners of my stash, poking yarn around and letting my brain wander. The purple yarn (Exclusive from Vlnap) which looks ink blue is a future striped sweater. This one didn't need any creative input from my side, my cousin asked for such one. It's going to be purple, fuchsia and cream white and I'll find a pic of the sample sweater when I'm in the company of my portable harddisks. The bit in carrot colours is the discontinued Katia Futura is going to be a sleeveless tunic for my friend's daughter which I promised long time ago. 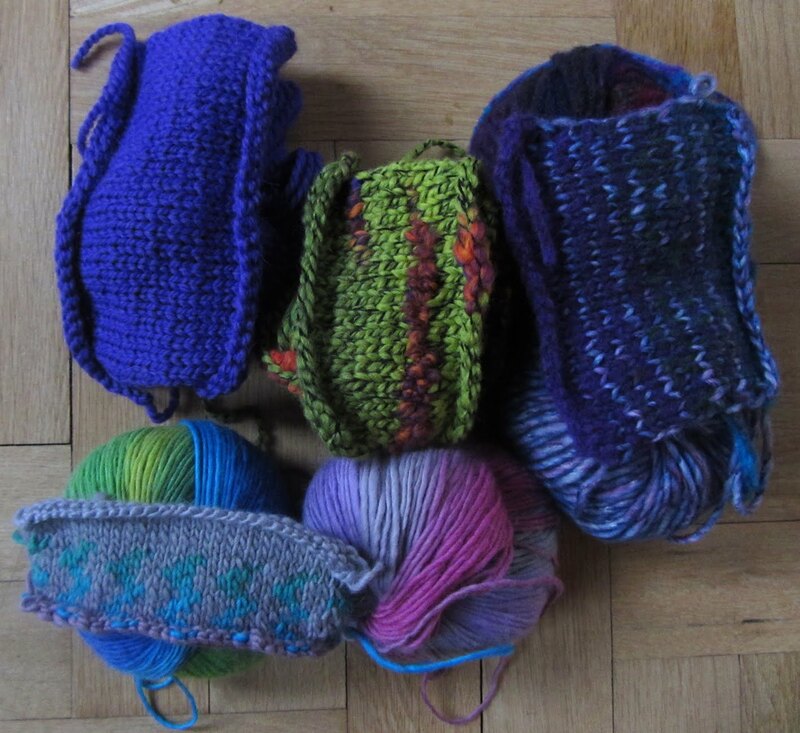 Stranded stuff is KnitPicks' Chroma Worsted and I need to order more, I only have three and four balls of each colour. The yarn is heavenly smooth, colour changes are subtle and the only task now is to find the right pattern. The purple and purple stuff doesn't work the way I'd want it so it will be rethought. Three things to knit and now I can't decide which do I start now. Probably all of them at once. Progress will be reported. and I like your new WIP!